Clair and Jesse have barely been reunited when the world is plunged into its biggest crisis since the Water Wars. The D Mat network is broken. The world has ground to a halt. People are trapped, injured, dying. It’s the end of the world as Clair knows it, and it’s partly her fault. 'The girl who killed D Mat' is enlisted to track down her missing friend Q, the rogue AI who repeatedly saved Clair’s life. Q is the key to fixing the system, but she isn’t responding to calls for help, and even if she did... Can she be trusted? Targeted by dupes, abandoned by her friends, caught in a web of lies that strike at the very essence of who she is, Clair finds powerful allies in RADICAL, secretive activists who are the polar opposite of anti D Mat terrorist group WHOLE. However, if she helps them find Q, will she be inadvertently trapping her friend in a life of servitude, or worse, sending her to an early death by erasure? Caught between pro and anti D Mat philosophies, in a world on the brink of all out war, Clair must decide where she stands, and who she stands with, at the end. The world has come to a halt. After Clair had been captured by Wallace and destroyed the D Mat system, in which travel was painless and instantaneous, the world is demanding justice. But the D Mat technology was used to map our minds, our physique in order to create another, less animated version of ourselves. Simply known as Dupes, they are gathering en masse and have Clair in their sights. Ant Wallace who created the breakthrough technology is dead, but the Dupes continue to thrive and multiply. Clair's mission was to put an end to the atrocities of Improvement, a system created to heal the wounded, ill and dying, instead was used to change your appearance but also to allow the takeover of unwilling bodies, original and Dupes alike. When an entire world is reliant on technology to fabricate their food, clothing and all remain connected to the Air network, the population is in a panic and all fingers are pointed firmly at Clair. With the technology Abstainer Jesse as her only ally, she has no choice but to seek refuge alongside the Peacekeepers, a non violent policing organisation. They too demand answers, but it seems the authorities and gathering Dupes all want to find Q, the newly formed girl that has brought the world to it's knees. But Q has gone to ground, the genius hacker AI and programmer feeling betrayed by Clair, and rightly so. But the Dupes are determined to follow orders, they will stop the impending war on the condition that Clair surrenders, a notion her new team of 'Clair Bears' won't entertain. The Dupes are aggressive, strategic and hungry for blood. After their location discovered, the group have no option but to seek refuge with RADICAL, an independent group that segregate themselves in a bid to maintain their freedom. But when the Dupes track Clair down on an isolated base in Antarctica, it soon becomes apparent that they have a traitor in their ranks... This isn't a fight for supremacy, it's a battle to save the world. The Twinmaker series is a intricate science fiction future, with a rebellion against technology and a strong social message. Crash begins moments after Jump, with Clair now in the custody of the Peacekeepers and the world is in turmoil. Clair is beginning to realise the full extent of her actions, and sees the need to make rational decisions, the fate of the world may just depend on what path Clair chooses next. 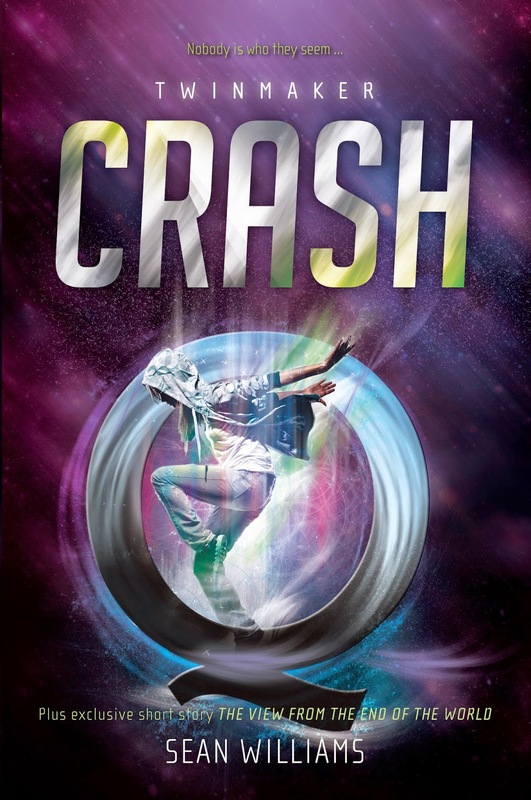 In Crash, I felt a compassion for Clair that I couldn't connect with in the previous novel, waking up knowing that each day may be her last. She isn't quite sure who to trust and her every move is being watched by millions around the world who are flooding the Air network with stories, gossip and lies. Her only ally is Jesse, who is a proud Abstainer. He refuses to use any form of technology or modern day conveniences, rather opting for an organic lifestyle. Clair needs to restore the technological dependent society. while Jesse believes that the world will adapt. Once again, romance isn't the focal point of the storyline. Where character development and world building were at the forefront in Jump, Crash needed to more than the deliberating and devising by characters to lift the storyline and progress in Jesse and Clair's relationship. It wasn't until after the first few chapters, where I was able to understand where Crash was headed. In the beginning, I felt disconnected to both the characters and storyline and only minor segments of book one were scattered throughout. With a lengthy wait between each book in the series, I needed a little more to be able to immerse myself from the first few pages, perhaps a prologue would have sufficed. More science fiction than dystopian, I really enjoyed the inclusion of the Dupes, where characters were artificially brought back to life and in mass. The only way to stop the production of their creation, is to destroy the patterns stolen from the use of the D Mat technology. But the majority of the storyline was spent speculating about the mysterious AI dubbed Q, and deliberating how to destroy the Dupes while fleeing to their next relatively safe location. Sadly it became a little too repetitive. The most stunning aspect of the Twinmaker series is the social and moral questions it raises. How Improvement was used to alter your physical appearance, being able to fabricate not just inanimate objects but also another version of yourself. The Air is a widely used social media superhighway, that isn't just a modern convenience but a way of life. Anyone doubting it's application, such as the Abstainers or RADICAL are publicly mocked for their simple beliefs. Society has already proven that cloning is already possible, but as a whole, we've already reached the point where we rely heavily on technology and the Twinmaker series emphasises how dependent we all are. Although I was a little disappointed at the lack of development in Crash, the stunning and surprising climax has me needing to know where Sean Williams will end the series. I'm looking forward to Fall, the final installment in the Twinmaker series. I haven't read this series yet, but no surprise there since I'm not really a fan of the genre. You make a great case for this series, even though you're a little disappointed with this instalment. Fantastic review on this Kelly! I haven't started Jump yet because I've heard variable things, but I really do like the exploration on social and moral questions and the science fiction used, even though it was a little repetitive. Great review!